The DataPlane Admin must have assigned you the required role for any service you want to access. Click the (Service Navigation) icon in the upper left corner of any page in DP Platform. Click the tile for the service you want. If the service you want to access is not displayed, either the service is not enabled or you have not been assigned the role required to access the service. 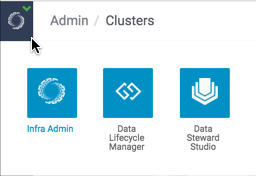 The DataPlane Admin can enable services and assign roles.